C2E2 was an amazing experience. It was my first convention and it left me extremely excited to attend another. While there, I learned that numerous vendors attend conventions and sell their wares for awesome prices. I most definitely was not prepared for some of the deals that I saw and that led to a few purchases I may not have made if not for the excitement all around me. Included in these purchases were the three Runaways hardcover trades that encompass the first volume of Runaways. Despite the impulse buy, I definitely do not regret these purchases in the least. 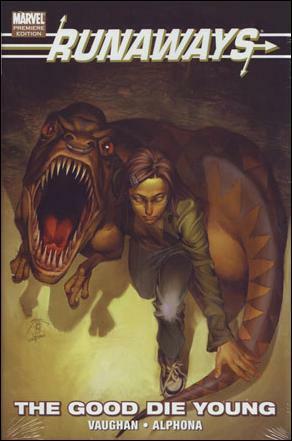 I read the entirety of the first volume of Runaways about a year or so ago. Before I even began reading them though, I was already hooked thanks to the concept alone. Teenage kids learning that their parents are super-villians just sounded like a great story to me. During our teenage years, I think every one of us has thought that our parents were super-villians at some point or another. What would any of us actually do if that were true? I was intrigued to see how this story played out, and I was far from disappointed. For the most part, the comics I read are typical super-hero comics. I’m used to the likes of Captain America, Iron Man, and X-Men for the most part. The fact that this story wasn’t as focused on the kids’ individual abilities as much as it was about these kids being put in an impossible situation and how they deal with the fallout of their normal lives falling to pieces. That made this story feel more unique that anything else I’d read. I realize that this may not be as unique to those that have read quite a few more comics than I, but for me, thanks to it being so different from what I usually read, allowed this book to draw me in so much more completely than many other books do. I enjoyed that each kid begins relatively unremarkable. They’re nothing more than typical teenagers. Each kid then discovers that they have something that makes them remarkable whether it’s an ability, a certain weapon, or a powerful pet. They then attempt to take their skills to the street and balance the cosmic scales by doing good deeds to offset their parents’ misdeeds. While it doesn’t exactly go as well it seems to for other super-heroes, it’s nice to see them make the attempt. The threat of the mole in their group builds the suspense as the story progresses as well. I found myself venturing guesses when I first read the issues, and I was pleasantly surprised when one of my least likely candidates was the mole. What made it most surprising though was the fact that it was explained intelligently. It wasn’t simply a twist just for shock value. Despite this being my second read through, I found that the story hadn’t lost the pull that it held from my first read through. Having read all of the current issues of Runaways and knowing where the story goes post volume one, I found that this made no impact on my enjoyment of the entirety of this first volume. I think that says a great deal about the story. It stands so spectacularly on its own making it easy to jump back into that story at any given time. I firmly believe this story will withstand the test of time and be able to hold up years down the road. Brian K. Vaughan spins some incredible tales, and I think this may well be my favorite of his work. I also found the art to set the perfect tone for this story from start to finish. Adrian Alphona’s pencils were crisp and clean in each and every issue. It appeared a little more mature which I felt complimented the story. Some art on later issues in volumes two and three was a little more “cartoony” which I felt went against the type of story that was being told. Along with Alphona’s interior work, I felt Jo Chen’s covers were absolutely astounding. They were so incredibly detailed really showed off each character in awesome poses. While some of the later story arcs were less than stellar, Vaughan’s first volume is easily one of my favorite comics. The progression from typical teenagers with parental issues to legitimate heroes was an absolute treat to read and experience. For me, this story is definitely placed up there with Whedon’s Astonishing X-Men run on my list of must read stories. « Secret Avengers Line-Up! Not really a secret anymore!